For a variety of reasons both business and biological, New England IPA and its variants were destined to succeed, and last year proved to be a banner example. Sierra Nevada’s Hazy Little Thing cashed in almost $24.5 million of IRI-tracked sales in grocery, convenience, and other stores, more than Cigar City Jai Alai and almost as much as the entire Terrapin portfolio of beers. New Belgium’s Voodoo Ranger Juicy Haze IPA, with $12.8 million in sales, was on par with Oskar Blues’ Dale’s Pale Ale. It’s just the tip of the iceberg, too, considering that so many of these kinds of beers released at breweries for own-premise sales only aren’t tracked by market research companies. So when style leaders Trillium or Tree House sell almost every drop out their front doors, we’re missing out on millions of other dollars being spent by beer lovers. Still, the combined dollar sales of New England IPA-inspired beers sold by Sierra, New Belgium, and Samuel Adams amassed about $43 million in 2018, the same price of the royal wedding of Meghan Markle and Prince Harry. It won't be for long. With expansion plans at brewery HQ and with help from contract partner Brew Detroit, Fitts says total capacity will increase by 120% by mid-February. Like most beers, the ease into the spring and summer months always proves a big time of year, with Memorial Day clocking in as the #2 beer-selling holiday for off-premise sales, leading into #1 with the Fourth of July months later. Removing the natural bump in percentage growth from April-June based on lower beer sales that start every year, the main summer months and end of year offer a unique look at brand health. Looking across seven more-widely-available examples of the style, it goes to show that, at least when it comes to NE IPA that's sold on grocery store shelves and not out of a taproom, there's a normal drop-off. These factors can be due to availability, production schedule, and other things. It’s also important to note how the October-December timeframe compares to beer overall. When looking at quarterly IRI volume sales for all of IRI’s beer and defined “craft,” as well as the IPA versions of those, the summer highs are higher for these NE IPA brands. Perhaps predictably, the winter lows can be a bit harsher as well. For the NE IPA set, it’s hard to miss the big drop for Bremerton, Washington's Silver City Brewery and its flagship Tropic Haze, but Dan Frantz, marketing manager for the company, said it’s natural. “Tropic Haze saw the same decrease by percentage as our other year-round beers during this seasonal transition,” he tells GBH, noting that the tropical, year-round beer was still a “champ” with 25% year-over-year volume increase in the fourth quarter of last year. And despite any drop-off during slower months of the year, it still reigns as Washington’s top-selling Hazy IPA, not to mention the brewery’s #4 IPA, period. But that’s just IRI sales. By other measures, there was plenty to be excited about for Haze Bois and Gurlz. Untappd reported that New England IPAs received a 68% increase in check-ins in 2018 compared to the year before, tallying almost 7 million in total and ranking as the fourth-most checked in style on the rating app, behind IPA, DIPA, and Pale Ale. Gage Siegel, “master of beer releases” with BeerMenus, an on-premise service that tracks and displays beers for restaurant and bar customers, tells GBH that after adding NE IPA as a defined style in 2018, 2,801 beers were entered into the BeerMenus system. New England Double IPA, Milkshake IPA, and Triple NE IPA variations within the same hazy family accounted for another 452. Four NE IPAs were among the top-30 searched beers by pageviews for drinkers hunting down fruity, juicy flavors: The Alchemist’s Heady Topper, Lawson’s Finest Liquids Sip of Sunshine, Industrial Arts Wrench, and Old Nation’s M-43. Meanwhile, for those Old School NE IPA drinkers who see Lawson's Sip of Sunshine as one of the beta versions of the style? Well, that beer alone sold nearly as much as the entirety of Sixpoint's portfolio. 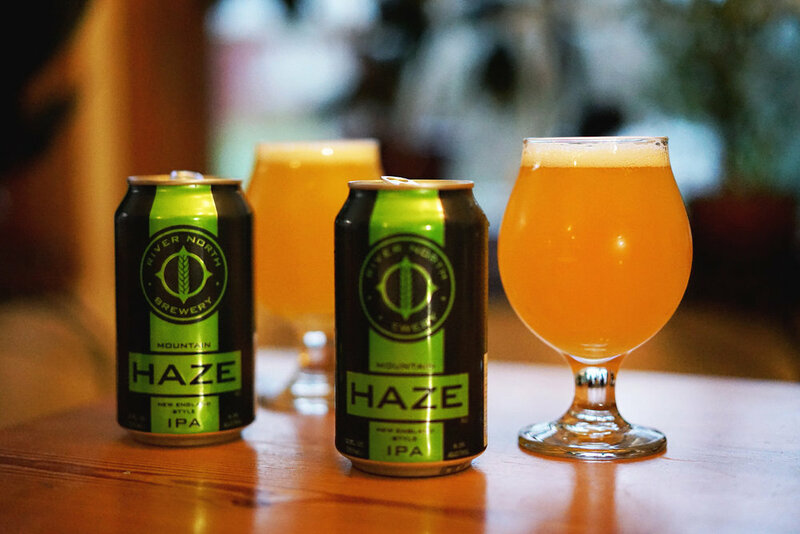 Now that drinkers have sufficiently moved the style out of the realm of perceived “fad,” and even despite the increased experimentation around Brut and other forms of IPA, it’s clear how important haze has become for breweries of all sizes. Perhaps that’s why Sierra Nevada is pushing their version hard in 2019, when drinkers will get treated to 15-packs of 19.2-ounce cans of Hazy Little Thing. For the long-tenured brewery once reliant on Pale Ale, the future’s looking hazier than ever.